Does internet dating really work? Well every bone in my body tells me it won’t; it’s a world full of odd balls hiding behind in their screens, an affliction of a generation who have forgotten how to interact normally – face to face. But then increasingly I come across happy people who have meet exactly this way, and yes I’ve even been to a wedding of a good friend who met his partner on-line. It seems the internet and social media are a perfect means of putting like-minded souls together then and this is very much the story of how the collaboration between Sitting Spiritually and Simon Thomas Pirie came about. I had been aware of Sitting Spiritually and their swing seats for many years, but they were very much on the periphery of my focus as they were entirely emerged in the world of gardens and our work was almost entirely interiors based. That said, I’d always had a desire to make outdoor furniture and felt that some day an opportunity would come along. 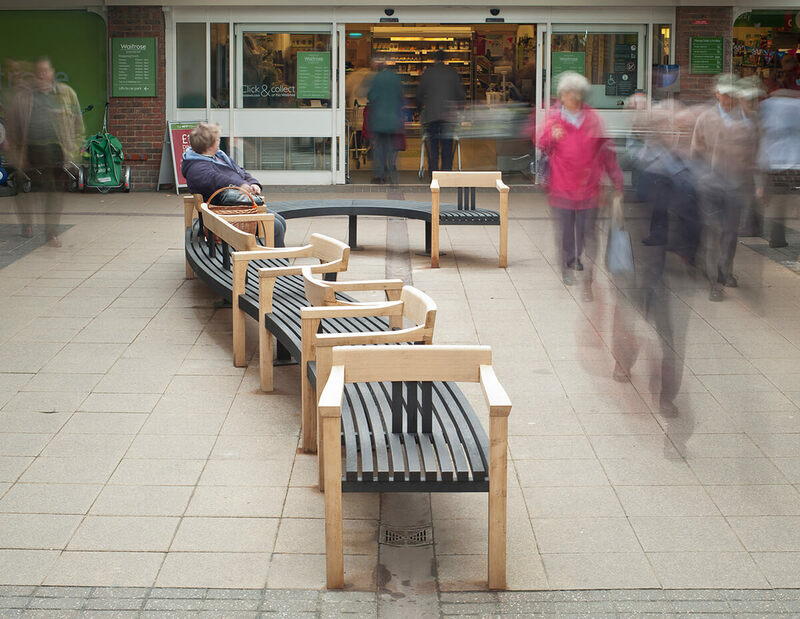 When it did it came in the form of a piece of dynamic public seating in a semi-covered shopping arcade in Dorchester, Dorset. We had been approached by a firm of London Architects to design a long 12 metre curving bench which would form the visual centre point of the face-lifted Tudor Arcade, this needed to be a place for people to sit, talk, rest and meet. Of all the projects I have designed it’s probably the one that gives me the most simple pleasure – because I pass it often and see people eating their lunch there, kids pretending it’s a bus and dogs tied to it waiting for their owners to return after disappearing into Waitrose. 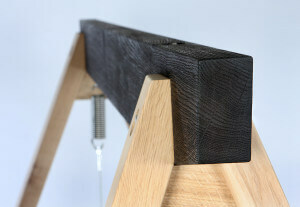 The Tudor Arcade bench has now become a well-known landmark within the town but it is also the start point for a strand of work that leads directly to the Sitting Spiritually Simon Thomas Pirie Contemporary Range. 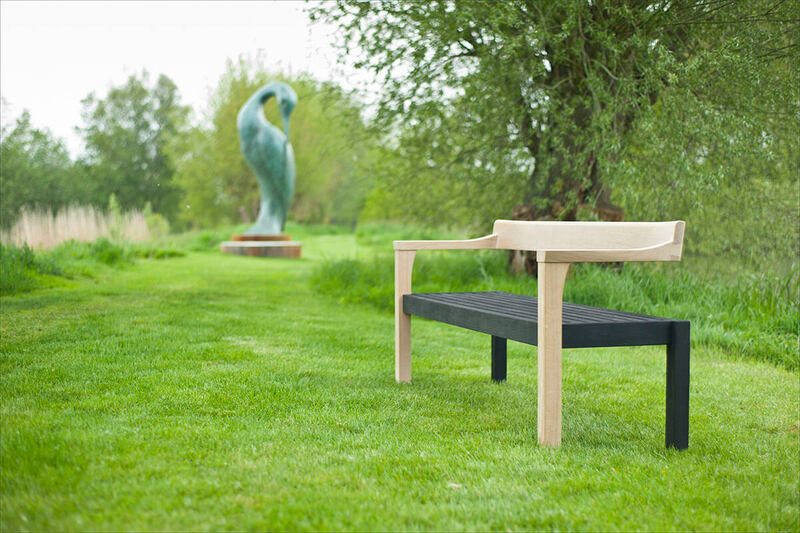 At its original launch Floating Bench got lots of attention and was featured in magazines like Wallpaper, House & Garden, Grand Designs, Homes & Gardens and the Garden Design Journal. It was hailed as a ‘design classic of the future’ by the Independent Weekend Magazine and was included as part of Liberty’s ‘Outdoor Living Collection’ in 2013. But it was the reaction it got though social media that really convinced us we had designed something special. I remember one of the many positive reactions we got at the time was from the Sitting Spiritually team. What I couldn’t realise at the time was the dialogue that was going on behind the scenes at Sitting Spiritually – about wanting a more contemporary swing seat to complement their existing product ranges and to attract a new type of client who were commissioning garden designers to ‘design’ their outdoor environments – very much in the way people have done with interiors for many years. So, in short they remembered the Floating Bench and contacted me – via Twitter at first of course! Needless to say you can’t build a good working relationship (or design a range of furniture) via Twitter alone and the conversations moved through emails to telephone conversations and eventually led to Martin, Siobhan and the rest of the Sitting Spiritually team and I meeting up to scope out what a Simon Thomas Pirie designed swing seat might look like. In some ways the brief was rather tricky because although they did want something contemporary and striking in the way Floating Bench is, it also had to fit next to their current product range in terms of using similar materials, hardware, delivery and assembly regimes. It was a fine line to walk, especially as this was the first time Sitting Spiritually had asked a designer ‘in’ to design a piece. Previously their more traditional ‘organic’ swing seats had been created as a collaboration between Martin and his daughter Lucy, who is a talented fine artist. I got told afterwards that Martin asked Siobhan “what happens if I hate it…?” Luckily he didn’t, he loved the designs and we agreed at that stage to proceed to a first full prototype to see what it would look like for real, but also test for stability and comfort. The new swing seat would use that two-tone scorched and natural oak combination again, which was one of the key elements that drew Martin and his team to us in the first place. 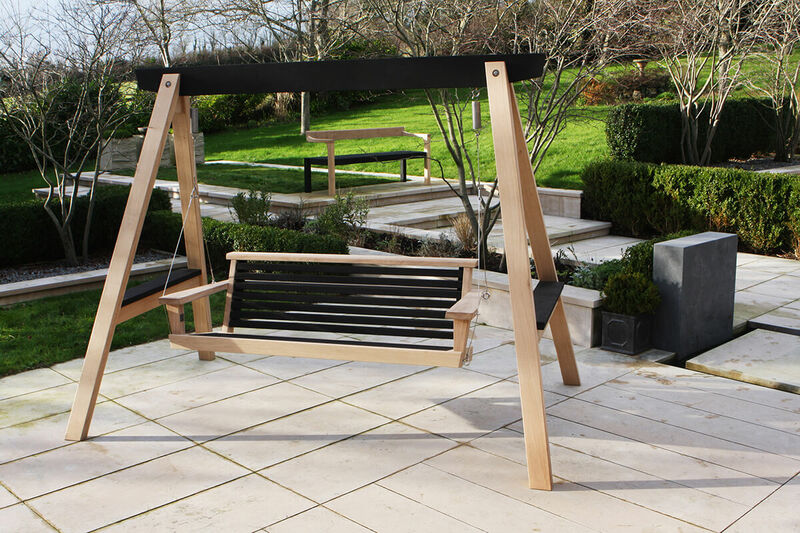 It made perfect sense to link the newly named Yakisugi Swing Seat (the act or the art of scorching wood in Japanese) with the Floating Bench and start developing the Simon Thomas Pirie Contemporary Range – to be exclusively available through Sitting Spiritually. The collaboration is very well balanced – it’s a great way for our name to get into this market and for Sitting Spiritually get a range of contemporary products they would not have designed in-house. There is plenty more to come as well, but let’s leave that for another time! So by Christmas 2015 the whole Sitting Spiritually team were standing in my studio & workshop looking at the fully detailed second Yakisugi Swing Seat prototype. Unlike the first version this was a full pre-production version complete with it’s new A-frame, hanging cables and two-tone scorched and natural oak details. That scorching gives the oak incredible deep texture and a colour which a stain or paint just can’t recreate. Everyone who sees it just wants to run their hand along it, Martin included. The other big change visually was the use of high tensile stainless wire for the swing supports instead of the chains that been had utilised on all their previous swing seats. 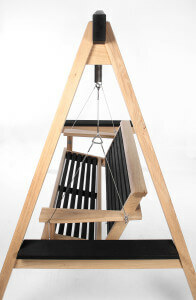 This again sets the new Yakisugi swing seat apart but also makes it look more contemporary. It has more in common with the use of cable in modern architecture or marine sailing applications. Yakisugi has a much lower back than any of the pieces in the existing Sitting Spiritually ranges and does engender a very different way of sitting, you tend to open your arm along the back rail of the seat which naturally turns you towards your seating companion in a quite subconscious way. As we are talking about the subconscious and furniture, another thing I feel really strong about how the arms feel in hand. There is something about the shape at the end of an armrest that needs to be really considered; the way your hand wraps around it needs to ‘earth’ you as the sitter so we avoided sending the suspending cable up through the middle of the arm detail as is traditional on most swing seats. Our cable is guided around the outside. Although our focus was on designing something very crisp and modern in appearance I’m also obsessed with comfort, as is Martin. We both strived to create a swing seat that you would want to sit all day in, so the way it looks has not compromised the way it feels. Visually with its lower back and very clean slats lines (we were very particular about not breaking the line between the scorched slats with any rails) the new swing seat is purposely very horizontal in appearance. It’s designed to echo the landscape and we hope will attract use by garden designers in more contemporary settings and the hard landscaped garden schemes which are so popular in current garden design. The initial response from high-end garden designers has been very encouraging with items from the Simon Thomas Pirie Contemporary Range appearing in show gardens at both RHS Hampton Court and RHS Tatton Park this year. Of course the big launch will be on the Sitting Spiritually stand at RHS Chelsea this May, that’s when we will get the real sense of how much the public and garden designers really like the new range. The collaboration continues to go from strength to strength because there is a real mutual respect despite both parties coming from very different furniture directions. It’s a shared vision of the road ahead – one-off striking contemporary swing seats and benches that are very different to anything else on the market. So is a Floating Bench or Yakisugi swing seat your perfect partner? Probably, you just don’t know it yet. Don’t be as sceptical about new ideas as I was about internet dating; you really just never know what’s around the corner. 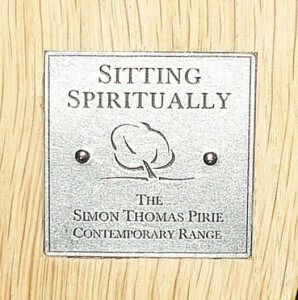 The ‘Simon Thomas Pirie Contemporary Range’ is exclusively available through Sitting Spiritually. For further details and prices click here. The range will be officially launched at the RHS Chelsea Flower Show – 24 to 28 May 2016. You will find Sitting Spiritually and a friendly welcome at Stand RHW 369. Images of Tudor Arcade Bench and Floating Bench at Sculpture by the Lakes by Double Exposure Photographic. All other Images by Maisie Hill Photography.